Given that March is National Noodle Month and the fact that I've partnered with Hidden Valley® to bring you some great new ranch-inspired recipes, I thought it appropriate that I elevate a classic pasta dish. I'm not really sure if manicotti are technically considered macaroni, but I am sure that this is a great dish. 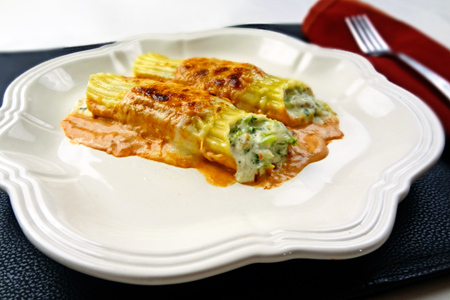 Traditionally (at least in America) manicotti are large ridged pasta tubes that are stuffed with a mixture of cheese, prosciutto and parsley. They are covered in a tomato sauce and baked. In my version I use a filling of Italian-style chicken sausage, a blend of five cheeses, Hidden Valley® Ranch dressing, and broccoli. I then top them with a marinara-ranch pink sauce. 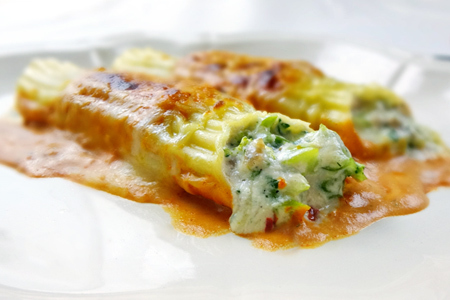 This ranch-ified version of manicotti is a simple, hearty, family-friendly meal that can be prepared ahead of time. It's also a great way to get your kids to eat their broccoli, as it's cleverly hidden in the filling. The Hidden Valley® Ranch in the filling and sauce gives this twist on the traditional a subtle but welcome new flavor dimension. Cook the manicotti according to the package instructions, drain, and cool in a single layer on a lightly greased sheet pan. In a large skillet over medium-high heat, brown the sausage. Remove from the heat, add the frozen broccoli to the pan, stir and set aside to cool for 10 minutes. In a mixing bowl, stir together the sausage mixture, ricotta cheese, 1/2 cup of the ranch dressing, 1 cup of the grated cheese and parsley. Combine the marinara sauce and the remaining 1/2 cup of ranch dressing in a small bowl and stir well. Pour half of the sauce into the bottom of a 13x9x2-inch baking dish (or two smaller dishes) and spread evenly. Spoon the filling into a piping bag fitted with a 1-inch round tip. If you don't have a piping bag, you can improvise by spooning the filling into a gallon size zip-top bag, removing the excess air and cutting off one corner to create an opening about an inch in diameter. Gently pipe the filling into one end of a pasta tube, then finish filling it from the other end. Repeat with the remaining pasta, arranging them in a single layer in the baking dish. Spoon sauce over each tube and sprinkle the remaining grated cheese over the top. If making ahead, cover the dish or dishes with plastic wrap and foil, and refrigerate up to three days. You can also freeze for up to two months. When ready to bake, cover the dish with foil and place in the oven for 35 minutes. Remove foil and bake for another 10-15 minutes, until hot and bubbly. I don't have to trick my kid into eating broccoli. He craves the stuff and I know that he would love this ranchicotti. Good one John. Thanks, Chris! We're also very fortunate that all three of our girls will eat almost anything. I know its cheating but it works like a charm and is so much easier than trying to wrestle a flopping noodle! Stuff your shells uncooked. Add one cup of water to your baking pan, cover with foil and bake as usual. Miracle. Perfectly done with sooooo much less work. Susan - I struggled with whether or not to use the "cheater method". I was leery that they wouldn't cook evenly and that the water might dilute the dish. I may have to try it one day.